When Abigail Levy was nine years old and watching her brother skate in a game, she decided she wanted to try it, too. She thought she might become the first girl to play hockey. “I was like, ‘Hey Dad, I want to play this sport,’ and I’d never seen a girl play it, so I was like, ‘I want to be the first one.’ I didn’t know that girls actually did play it, so I wasn’t the first one,” she said with a laugh. She might not have made history then, but nearly a decade later, Levy is making a name for herself as a freshman at Minnesota State Mankato. She’s played all but four minutes in net for the Mavericks and so far faced the third-most shots of any goalie in the country (415), but through 14 games, she holds a .952 save percentage, second-best in the nation. It’s not just about her own personal stats, either. Her impact on Minnesota State’s program has been as immediate as her play is convincing. Through 14 games, Levy and the Mavericks sit at 7-5-2, the program’s best start to a season since 2004-05. With her in net, the team has conceded a total of 20 goals this year, the fifth-fewest allowed by any team. For comparison, last year’s Minnesota State squad gave up 45 goals in its first 14 games. The Mavericks have been nearly perfect against non-conference teams, posting a 5-0-1 record against RPI, Robert Morris, and Lindenwood, and in WCHA play so far, they’ve only come away pointless against No. 1 Wisconsin and No. 6 Ohio State. Before coming to Minnesota State, Levy played at the prestigious Shattuck-St. Mary’s School in Faribault, Minn., winning three national championships and earning the school’s best athlete award in 2018. She says her time there helped make the transition to college hockey a lot easier, because her schedule as a high school student—practice in the morning, then class, then lift—was designed to mimic the life of a college athlete. Along with knowing a good chunk about what to expect in college, she also credits her teammates, coaches and family for giving her confidence and pushing her as a rookie. But Harrington says it’s her own demeanor on the ice that played a big role in the coaching staff’s decision to grant her an opportunity to start. In her first regular-season start, Levy pitched a shutout against RPI, then helped the Mavericks cap off a sweep of the Engineers the next day. She’s hardly left the net since—and Harrington has seen her build off of each performance as the season has gone on. Levy, though, is about as anxious to take credit for her team’s success as she shows when she’s out on the ice. Levy’s family is a big part of her support system, and they’ve helped her carve out a path to Mankato. When she moved from New York to Minnesota to attend Shattuck-St. Mary’s, her older sister went with her, choosing to go to school at Minnesota State Mankato so they could be close by one another. When it came time for Levy to make her own decision about where to play college hockey, she couldn’t pass up the chance to continue her playing career while going to school with her sister, who’s now a senior. Levy says her mom has had a big influence on her as a person. In terms of playing goal, someone else she looks up to is Northeastern sophomore goaltender Aerin Frankel, the only other player in the country with a better save percentage so far this year. They played together at SSM two years ago, and along with leading the field in save percentage, they’re both tied for the national lead with four shutouts. Levy has a competitive streak—when she’s not playing hockey, she likes to play other sports like basketball or volleyball—but she also has an easy-going nature, shrugging off praise and keen to let things slide instead of linger. Some players are extremely superstitious, banking on routines to propel them to wins and getting even more flustered by those routines when a game doesn’t go their way. But she prefers a different mindset. Her ability to brush aside those moments, back up her teammates and face the next shot helps the entire Mavericks squad. Perhaps for that reason, and the confidence they’ve built from their strong start, he’s seeing other differences in the group’s mindset. 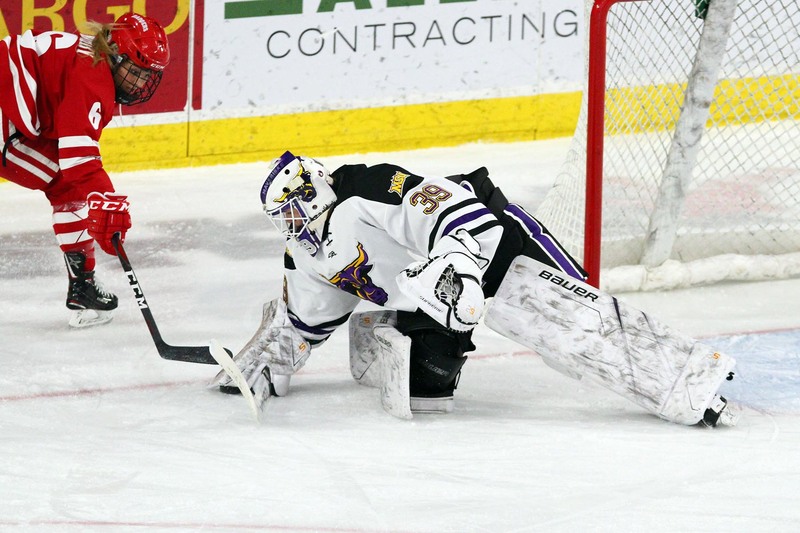 For a smaller program like Minnesota State, it can be tough to compete in the WCHA, especially against perennial powerhouses like Minnesota and Wisconsin and the resources they have at their disposal. Still, the Mavericks’ start to the year isn’t completely unexpected to Levy and her teammates. I think we have to do a great job playing the net front, both offensively getting to the net and getting our own second- and third-chances, and then I think we need to minimize Ohio State’s chances and second- and third-chances around the net. They’re a team that goes to the net hard, they play the game competitively, and they score a lot of goals on those types of goal-mouth scrums, so I think that’s going to be important for us. I think secondly is just the ability to win the 50/50 pucks, the ones that are jump balls. We need to win those races to the puck and we need to get possession and see if we can maximize. Clarkson/St. Lawrence at Cornell: This is a big home weekend for Cornell. The Big Red are currently ahead of both North Country teams in the ECAC standings, but they’ve also played two more games. Cornell has settled for a few more ties than they’d probably like in recent weeks, and I’d expect the game against St. Lawrence to be especially tight again. Clarkson’s top line has been excellent once again this season, and they really took off last weekend against Minnesota Duluth. Loren Gabel notched a four-goal game in the first tilt, Michaela Pejzlová had a two-goal game in the second, and Elizabeth Giguère posted six assists on the weekend. In all, they make up three of the NCAA’s top four scorers this year. Containing them will be a huge undertaking for the Big Red, and we should see defender Micah Zandee-Hart matched up a ton against them. Penn State at Robert Morris: The Colonials are second in the CHA standings while Penn State sits fourth, but overall, the Nittany Lions own a .500 record (7-7-2) and RMU is 6-8-4. The Colonials are playing well this year, though, and the numbers show it; they have the best shots on goals for (33.72 per game) and shots on goal against (22.89 per game) in the conference. Their goaltending hasn’t been super consistent, however, and for Penn State, Jenna Brenneman holds a .929 save percentage and 1.66 goals-against average. This is a good test for her and the Nittany Lions, who are trying to show they can compete with anyone in the conference and move up the standings. We’ll also see the top two scorers in the CHA go head-to-head this weekend, with RMU’s Jaycee Gebhard (27 points) going against Penn State’s Natalie Heising (18 points).